If you're looking for outstanding dividend stocks, our Foolish contributors think these three names should be at the top of your list this month. The so-called Dividend Aristocrats are companies that have raised their payouts for at least 20 consecutive years. With over 50 companies populating this elite list, however, it can be a tremendous challenge to pick the cream of the crop. To help with this task, three of our Foolish dividend experts have each picked one stock they think investors may want to take a deeper look at. This month, AbbVie (NYSE:ABBV), PepsiCo (NASDAQ:PEP) and McCormick & Co. (NYSE:MKC-V) have piqued their interest. Here's why. George Budwell (AbbVie): Although AbbVie was granted its Dividend Aristocrat status simply by being spun off from Abbott Laboratories, the drugmaker has made returning cash to its shareholders a top priority. During its third-quarter earnings release, for instance, AbbVie's management announced a noteworthy 12% hike to its annual payout. This recent raise is the fifth time the company has committed additional cash to its dividend program since it became an independent entity in 2013. The net result is that AbbVie sports one of the richest payouts among major drug manufacturers, with a current yield of 4.6%. The catch, though, is that AbbVie has been unable to break away from its over-reliance on the megablockbuster anti-inflammatory drug Humira to drive growth, despite significant efforts to do so. Humira, after all, continues to make up more than 60% of the drugmaker's annual revenue. That's a big problem, because this drug is scheduled to lose patent protection in the U.S. at the end of this year. And making matters worse, several major biopharmas are currently waiting in the wings in hopes of bringing cheaper versions, known as biosimilars, to market in the near future. The flip side is that AbbVie believes it can successfully stall biosimilars' entry to the market via legal means until at least 2022 -- if not longer. If so, that should give the drugmaker enough time for its next generation of high-value products -- such as the blood cancer drug Imbruvica -- to pick up the slack. All told, AbbVie's high yield, along with management's dedication to regular dividend increases, make this Dividend Aristocrat worthy of a deeper dive. Jamal Carnette, CFA (PepsiCo): When I'm in the market for dividend-paying stocks, I ask two questions in particular. The first is rather obvious: Can the company continue to pay and grow dividend payouts? However, the second one is just as important: Will the company be able to grow its market share and earnings? In the long run, companies that grow earnings should be rewarded with higher per-share prices. And it makes little sense for income investors to hold on to a company for a dividend while watching the share price erode. One Dividend Aristocrat that's well positioned to continue its streak of paying and raising dividends while growing its top line is PepsiCo. Let's discuss the elephant in the room first: The company is working to change its reputation as a junk-food purveyor. Last quarter, the company noted that 45% of its net revenue came from what it calls "guilt-free" products, which are drinks with less than 70 calories per 12-ounce servings and snacks with low levels of sodium and saturated fat. This shows the company's commitment to addressing consumer concerns, and it should make the business more sustainable going forward. While demand for soda has declined, PepsiCo's diverse stable of food, snack, and beverage products has helped the company withstand weakness in the soda industry. Over the last five years, the stock price has risen by about 72%, while PepsiCo's biggest soda competitor, Coca-Cola, has disappointed investors with only a 26% gain. Even after this outperformance, PepsiCo yields 2.8% -- not remarkable, but still higher than the yield on the 30-year U.S. Treasury. PepsiCo should continue to reward investors. The company expects to achieve 4% organic revenue growth in fiscal year 2016 and to return a total of $7 billion to shareholders in the form of dividends and share repurchases. The combination of shrewd corporate strategy, a diverse stable of products, and shareholder-focused capital policies makes this a solid stock for income-seeking investors. Daniel Miller (McCormick & Co Inc.): When you're looking to add shareholder-friendly stocks to your portfolio, one of the quickest and simplest ways to find a winner is to graph shares outstanding and dividends over the long term. If the two lines forms an "X" in the graph, then that's proof that management has paid a consistent dividend to investors while reducing its shares outstanding. McCormick fits this bill, and 2016 marks the 92nd consecutive year of dividend payments. 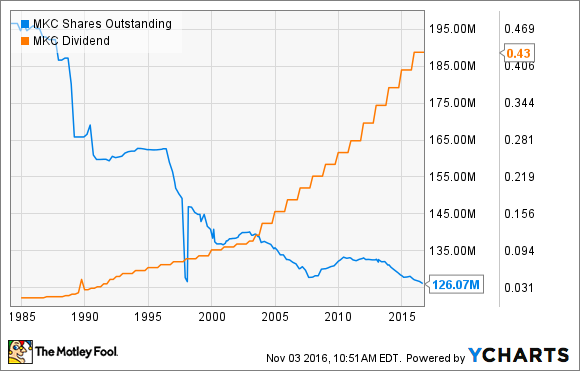 MKC Shares Outstanding data by YCharts. Most of us are familiar with McCormick & Co., even if we don't realize it. The spice company manufactures, markets, and distributes spices, seasoning mixes, condiments, and other flavor products to the entire food industry. McCormick has $4.3 billion in annual sales and more than 140 brands in more than 140 countries, so it's likely that you have one of the company's products in your spice rack, even if it isn't labeled McCormick. McCormick already sells to nine of the top 10 food and beverage companies, along with all of the top 10 food service and restaurant chains in the U.S., but it still has plans for growth. The company notes it has outperformed the rest of the food industry in terms of return on investment for advertising, boosting its base business. It also plans to continue developing innovative new products and strategically building its footprint through acquisitions, like its recent Gourmet Garden purchase. The good news is that, if the past decade is any indication, McCormick's business strategy is on the right track. Source:McCormick 2016 Bernstein Strategic Decisions Conference. Looking beyond its growth ambitions, McCormick is also putting together a cost-cutting plan. More specifically, it has a new four-year, $400-million target that will come from vendor consolidation, high-speed equipment and automation, system technology, and streamlined selling, general, and administrative expenses. All in all, McCormick is a proven company that has consistently returned value to shareholders and still offers a global growth story. The only downside is that you'll have to pay a slight premium for its shares: McCormick trades at a forward price-to-earnings ratio of 23, according to Morningstar estimates -- which is to be expected of great companies.